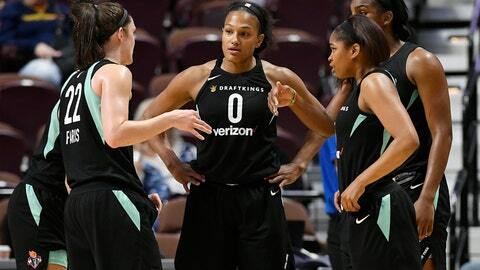 NEW YORK (AP) — While most WNBA teams are battling for playoff spots in one of the league’s most competitive postseason races, New York, Indiana, Chicago and Las Vegas are jockeying for the draft lottery position. The league changed the lottery system in 2015 to include teams’ record over a two-year span to avoid teams tanking to get the top draft pick. Indiana has the best odds to get No. 1 with a 14-48 mark over the past two seasons. Las Vegas, which is still in the playoff hunt, currently has the second-best chance, two games ahead of Chicago in the two-year standings. The Aces put more distance with Chicago on Tuesday when the league ruled their game against Washington last Friday would be a forfeit after the Las Vegas players decided not to play because of health and safety after traveling for 26 hours to get to D.C.
New York, which finished with the third-best record last season, has assured itself the worst chance to get the No. 1 pick this year. The Las Vegas franchise has had the top pick the last two years. While there was no doubt that A’ja Wilson was the consensus No. 1 pick in the 2018 draft, no leading candidate has emerged yet for next year’s pick. There are a lot of talented college seniors in the draft, including guard Asia Durr of Louisville, forward Katie Lou Samuelson of UConn and centers Kalani Brown of Baylor and Teaira McCowan of Mississippi State. 1. Seattle (22-7): With a playoff berth locked up, the Storm are now trying to secure the No. 1 seed and a bye to the semifinals. 2. Atlanta (18-10): A huge win in Minnesota has moved the Dream closer to clinching a playoff spot. While catching Seattle will be tough, the two seed is definitely within Atlanta’s grasp. 3. Los Angeles (17-11): Finally healthy and playing solid defense has helped the Sparks turn things around. 4. Phoenix (16-13): Mercury are still struggling to find consistency and a replacement for Sancho Lyttle, who suffered a season-ending injury a few weeks ago. 5. Connecticut (16-12): Sun have seen a reemergence of Jonquel Jones lately and that’s helped buoy the team’s four straight wins. 6. Washington (17-11): Kristi Toliver scored final eight points to help Mystics beat Dallas in a pivotal game. Mystics are in the mix for at least a first-round playoff bye. 7. Minnesota (15-13): Had a chance to gain ground with games against the top three teams in the league and went 0-3. 8. Dallas (14-14): Wings have dropped five straight games and are fortunate they have a cushion over ninth place Las Vegas. 9. Las Vegas (12-16): Just can’t get any kind of momentum to make a playoff push. 10. Chicago (10-18): Dug a big hole early in the season because of injuries and have been trying to climb out ever since. 12. Indiana (5-23): Won consecutive games for the first time in over a year and are trending in the right direction.